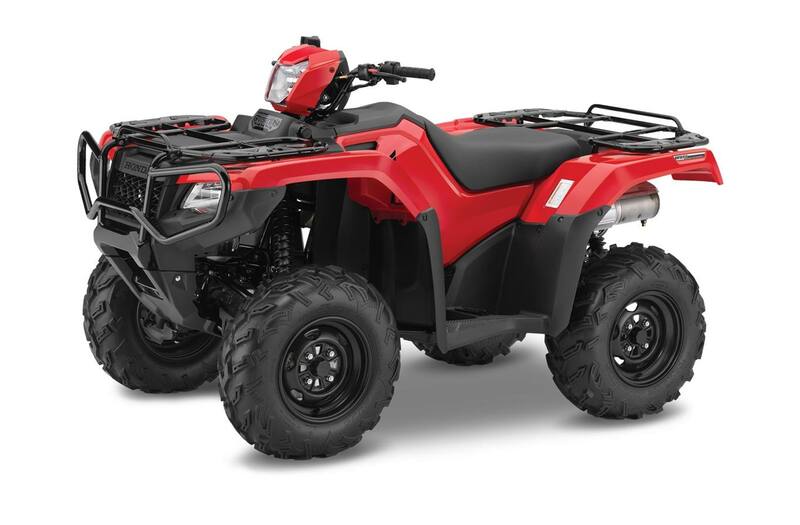 Efficient, durable engine design: Powerful liquid-cooled 475 cc engine is longitudinally mounted, allowing direct driveshaft alignment to both front and rear wheels for maximum drivetrain efficiency. Liquid cooling provides consistent engine operating temperature in extreme conditions for maximum power output and long engine life. Overhead-valve design provides compact engine dimensions for improved ground clearance while maintaining a broad, easy-to-use powerband. Rubber-cushion engine mounting and gear-driven counter-balancer reduce vibration. Advanced transmission with three drive modes: Rugged five-speed transmission features manual foot shifting with an automatic clutch. 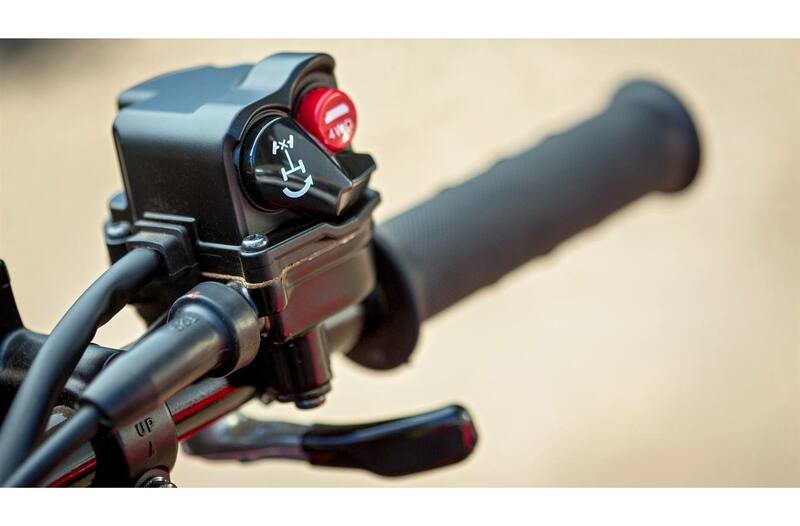 One-handed reverse shift mechanism allows you to select reverse without ever taking your hand from the handlebars. Super-heavy-duty automatic clutch with low-rpm engagement for excellent drivability and towing capacity. 2WD/4WD system offers three drive modes: 2WD; 4WD with torque-sensing front differential; and 4WD with locked front differential to optimize traction. 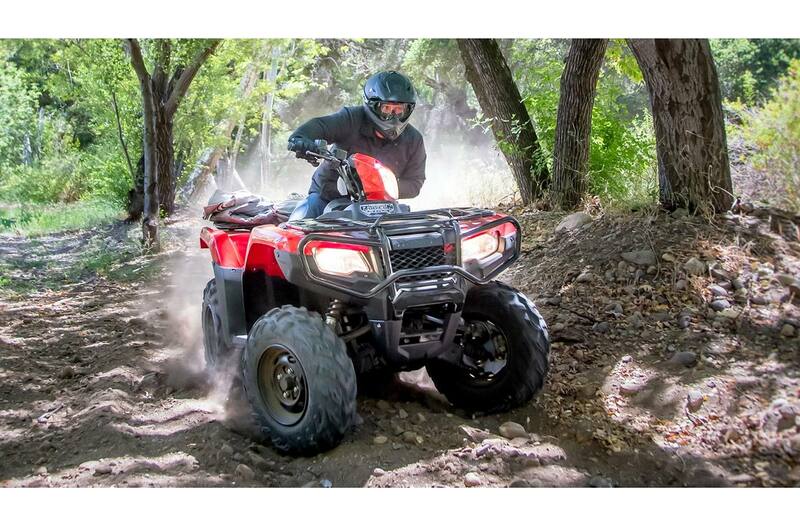 The system also features a Speed Override mode that can be engaged when the front differential is locked to allow increased wheel speed under severe conditions, such as deep mud. Easy and efficient: "Convenient electric starting, with an automatic internal-decompression system, gets you going quickly and easily. Programmed Fuel Injection (PGM-FI) improves power delivery and throttle response, and increases fuel efficiency for extended range. " Quiet operation: A sub-chamber in the air cleaner reduces resonant noise for quieter operation. Long-lasting performance: Stainless-steel exhaust system includes a USDA-qualified spark arrester/muffler designed for quiet operation without servicing for long-lasting performance. Powerful output: High output 470 watt alternator has extra capacity to help power electrical accessories and to keep personal electronics charged. Strong and lightweight: Durable double-cradle steel frame developed with Computer Aided Engineering is sturdy and lightweight for precise handling and a smoother ride. Independent Rear Suspension, excellent handling: Double-wishbone independent front suspension provides 185 mm (7.3 in.) 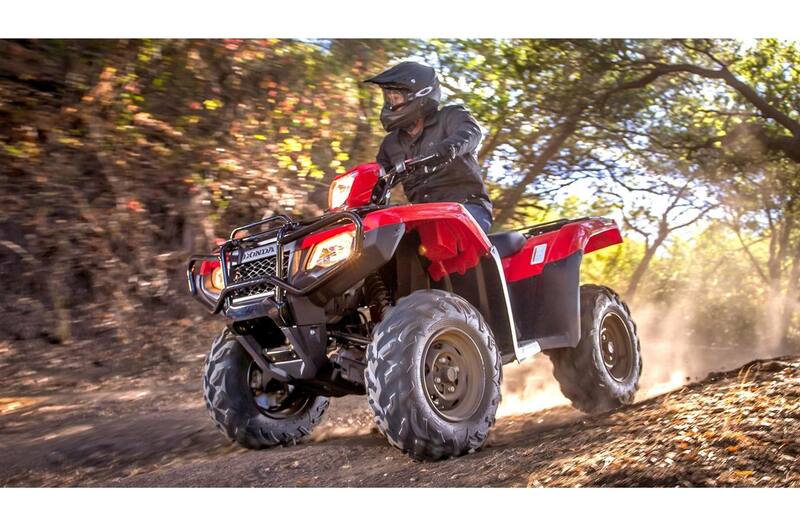 of well-controlled travel, providing a sense of security and control over difficult terrain. Independent Rear Suspension (IRS) design with lower A arms and upper I arms features optimized stiffness for improved handling performance, and an ample 215 mm (8.5 in.) of travel. Durable wrap-around guards protect the rear suspension's lower A arms when rock crawling. Adjustable spring preload on all shocks allows suspension to be tuned to match varying loads and riding conditions. Excellent traction: Aggressively styled Maxxis tires provide excellent comfort and traction. Durable construction: Plastic CV joint boots on the front driveshafts are durable and tear-resistant. Extended reliability: Sealed steering-knuckle bearings for extended durability. Smart mounting: Inboard rear disc brake is mounted on the rear driveshaft, reducing unsprung weight and keeping the disc out of harm's way in rugged conditions. Strong stopping power: Dual front hydraulic disc brakes with large 190 mm rotors provide strong stopping power. The brake calipers feature a built-in scraper system that removes mud and snow from inside the front wheel to help prevent build-up of debris between caliper and rim for consistent braking performance. Protective bodywork: Bold bodywork offers excellent mud and debris protection. Terrific visibility: "Twin-headlight system features 35-watt headlights with focused light distribution for improved visibility after dark. 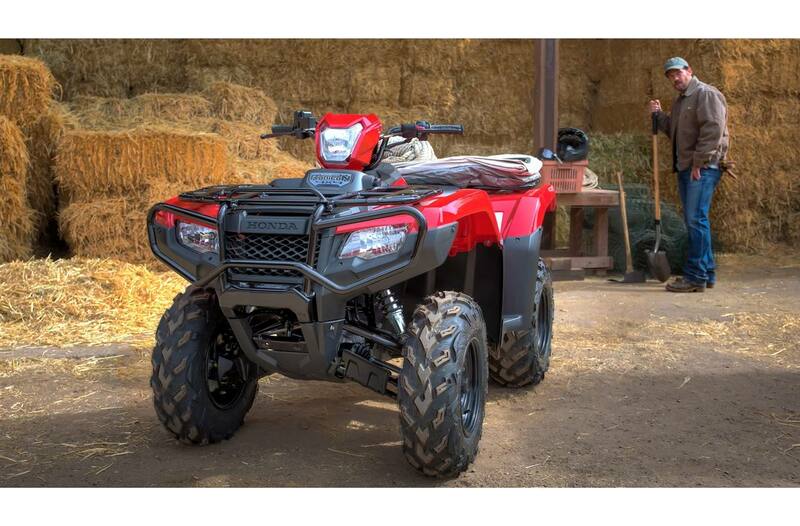 Top assist 50-watt light operates independently of front headlights, allowing it to be turned off while carrying a load on the front carrier. " Easy access: Clever one-piece tank/side cover design requires no tools for removal, providing quick access for maintenance. Automotive technology: The fuel pump derived from Honda automobile technology is mounted in the fuel tank for better heat isolation and increased filter life. All-day comfort: Substantially larger and thicker than the seats found on more utility focused models, the Rubicon's seats provide all-day comfort. Textured seat cover is cooler on hot days and provides a more secure feeling, especially against synthetic riding-gear materials. 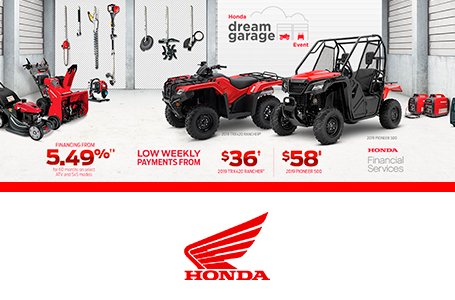 Half-waffle-style hand grips similar to those found on Honda's off-road motorcycles offer improved comfort while maintaining a secure hold in wet or muddy conditions. Intuitive display: "Full-function instrumentation gives the dash a modern look while providing information at a glance. 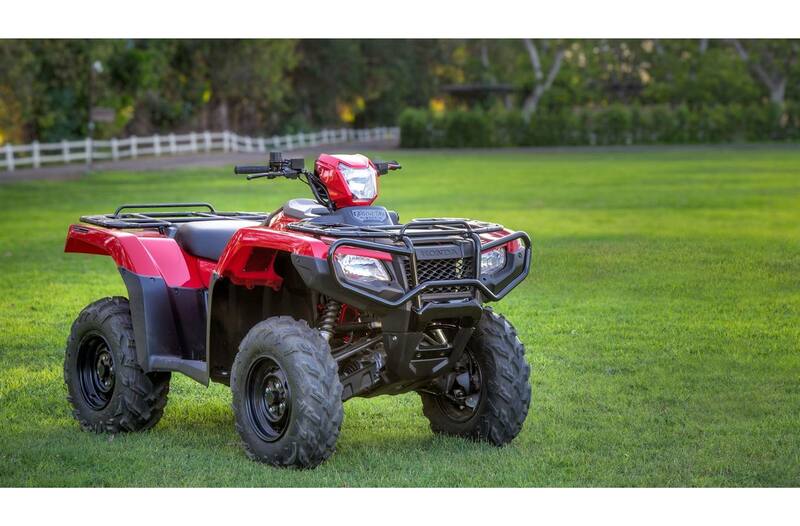 The display includes speed, odometer, trip meter, fuel gauge, coolant temperature, clock, gear position indicator, 4WD indicator and even a Maintenance Minder system that notifies when it's time for service. " Built tough: All-steel full-sized front bumper wraps around the headlights, improving protection and adding to the Rubicon's aggressive appearance. The bumper also features an integrated mount for an accessory winch. Excellent load and towing capacity: Front and rear steel-tube carriers feature large steel plates and additional tie-down points for improved load security. Load capacity for the large front and rear carriers is 45 kg (99 lbs.) and 85 kg (187 lbs.) respectively. Heavy-duty trailer hitch with 600 kg (1,322 lbs.) towing capacity.